These pages are dedicated to the memory of the Fallen named on the Memorial. We have galleries with images of the Fallen of both World Wars – WW1 and WW2. 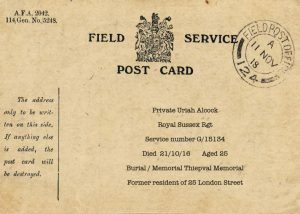 There are many of the casualties for whom we do not have any photographs and we would love to receive any pictures which people may have. If you have any photos then do please contact us. 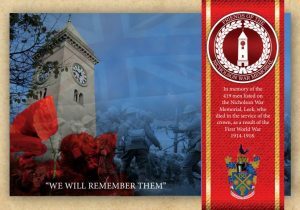 For the centenary of the WW1 Armisitice the Friends of the Nicholson War Memorial and Leek Town Council had cards produced for each casualty of WW1. These were posted to their original addresses where known. You can download a PDF of the cards here, or by clicking the images below. Available for download is a list of the Military Burials (including one civilian killed by enemy action) at Leek Cemetary and also the location plan of those graves.